This week, I’m looking at a classic mistake people make when targetting their ads: not targetting it at the correct level of customer. To do it, I’m using this ad that popped up in my newsfeed. Here’s what I don’t like about it: I have no idea what a “mumbler” is. At first, I thought it was some kind of speech impediment group. I’ve got a lot of friends who have come through the McGuire Programme, which helps with stammers, so I assumed it was something similar at first glance. But then it mentions babies, so I’m wondering whether it’s a mum’s group. None of what they are doing makes any sense. First, why am I seeing this? They could set the targeting to be people who have interacted with their page or visited their website, in which case it makes sense to go straight into your sales copy without explaining what your group is. Or, if it’s a general ad, they need to explain what it is. Think of Eugene Schwartz’s levels of awareness. They need to tell me what their group is. 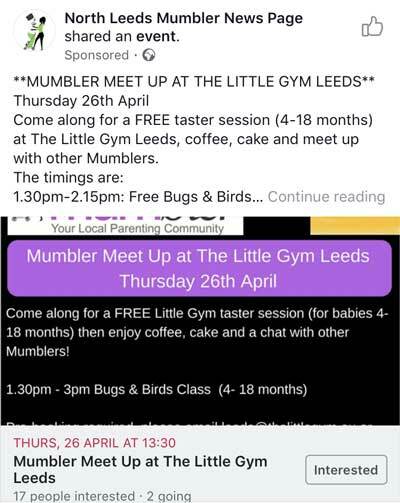 If it is a mums group, why am I seeing it? I’m a dad. They can set gender targetting on the ad to just include mums, or they could have a separate version of the ad, targetted at men, which makes it clear that dads are welcome too. I’ve written before about how community groups should not use Facebook ads. Do it if you know what you’re doing. But you probably don’t know how to write copy or set the targeting, so you’re probably wasting your money. This ad is a good example of that. If you do want to use Facebook ads, then make sure you know how to target your ads appropriately and come up with relevant ads for each audience segment. This entry was posted on Tuesday, May 15th, 2018 at 11:00 am and is filed under Business & Marketing. You can follow any responses to this entry through the RSS 2.0 feed. Both comments and pings are currently closed.